This was the second trip in my month’s post-‘Millennium Bug’ break. I never saw anything of the Millennium problems, but enjoyed the break! The focus was on lines in the former DDR once again and my life’s companion proved her mettle by accompanying me, not for the first time, on a week’s heavy duty trackbashing. Refreshed by (yet another) quiz defeat last night, H and I set off by taxi and the 1017 Telford - New Street (153 + 150). The 1106 Paddington was cancelled due to ‘mechanical problems’ but 1115 Euston, packed with happy Cruftgoers, was more than adequate. H liked the new AbDab bar (Bass, Brew XI and Highgate Saddlers) more than I did. The Granary provided a sound all day breakfast at a rather Forte-fied price. BA’s Airbus A319 made an exactly on time departure [from Birmingham] and a 10 minutes early arrival [at Düsseldorf] but then sat for 10 minutes waiting for a Lauda Air 767 to vacate the gate. Arrival was slightly late, immigration was slowish, baggage was slowish but we made the 1623 S-Bahn with 9 minutes to spare, and also the 2 minute connection for Duisburg at Düsseldorf-Unterrath. A brief supplies break at Duisburg before 1700 to Eisenach which made a very early arrival behind a 101. At Hamm the stuffed TEE set is looking in poor condition externally and has suffered the graffiti artists. The owners should take more care! The remainder of the journey to Kassel was completely uneventful though the train was well filled. Arrival at Kassel was around 3 minutes early, and the InterCity Hotel was considerably more welcoming than its compatriot at Magdeburg. A sharp exit was made for two weissbieren in a pub across the road called (we think) the Rolling Stone. Very much into pop music but fortunately not on Friday nights! The weissbier was something like Schifferhof - not previously encountered and very pleasant. A poor night’s sleep (due to my cold, no fault of the hotel) was followed by a very good breakfast (well, maybe the boiled egg was a bit hard). The 0807 to Nordhausen was nearly full but seats were available. It took us to Nordhausen where steam is getting to be a rare event. It didn’t seem wise to wait for the 1008 to arrive given that our connection left at 1011 so we retired for a coffee. 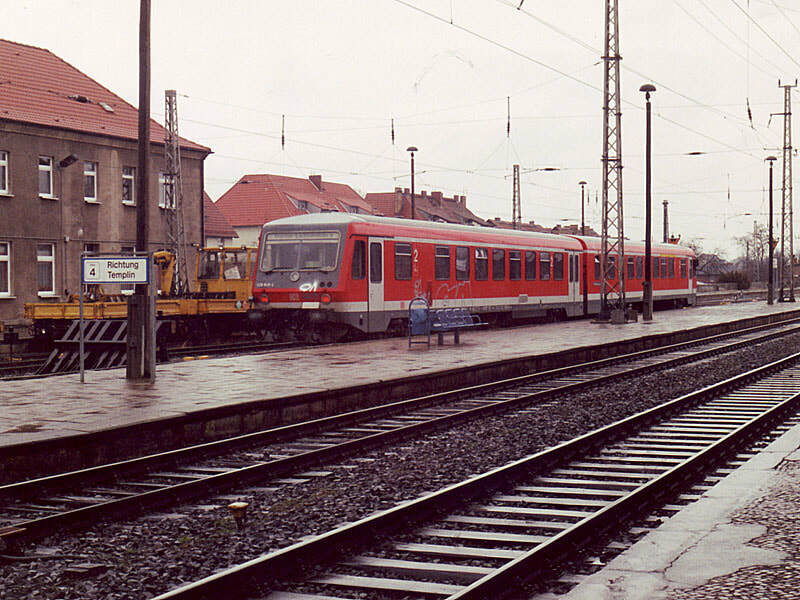 The Bretleben service was 2 x 772 and suffered a 5 minute delay at Sondershausen due to a late running northbound Erfurt service. ‘Super power’ on this with 232 432, 232 258 and 3 coaches. Possibly 258 had failed. A leisurely trundle was had to Bretleben where the junction is beyond the station! Parallel alignment though. Patronage was variable but really only significant when a dozen or so army cadets got on at Bad Frankenhausen. Another 232 with double deck coaches worked the short hop from Bretleben to Artern where the station is very dingy and run down. The RegioSprinter (or equivalent) for Naumburg was waiting so we whiled away the remaining 15 minutes in the warm. As far as Nebra there is only a 2 hourly service and the whole line seems to have a 50 kph limit presumably due to the state of track. Vitzenburg looked just as bleak as on 28.12.98. Iwouldn’t want to put my pension (!) on the line surviving west of Nebra. At Naumburg a hasty (and very economical) lunch was taken in the station buffet accompanied by 0.33l of Apoldaer, which is not the worst pils-type beer I’ve ever had. We made the kart for Teuchern with 2 minutes to spare and had a short damp wait for another RegioSprinter (or near offer) back to Weissenfels to fill in the second annoying gap of the day. After freezing for 15 minutes at Weissenfels an SE took us to Grossheringen where the Straussfurt train was waiting in the loop platform 5. A proper train this time with 202 555 and two empty coaches. The usual debate occurred with the gripper who (reasonably enough) thought Grossheringen to Erfurt via Straussfurt was Not Sensible. We persevered, and were rewarded with a red line on the map. Not the most interesting scenery, and very few passengers. 202 484 crossed our train at Kölledn where there was some freight in evidence. 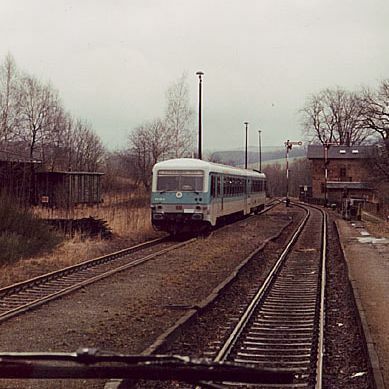 202 385 passed at Sommerda where the Straussfurt - Grossheringen line passes beneath the Sangerhausen - Erfurt line. 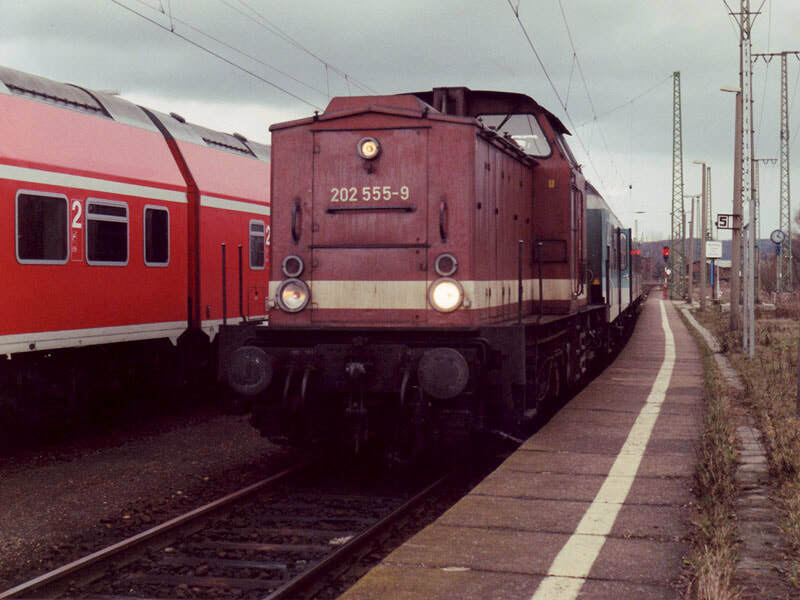 We arrived at Straussfurt (connection north of the station) in time for another encounter with 232 258, obviously in good health, which took us to Erfurt Hbf, passing 232 121 heading for Nordhausen. Erfurt concluded the day’s gricing and we proceeded on an SE to Halle and a local to Leipzig where the Ibis provided a room at the weekend rate. Out for a beer to finish and H unerringly located an excellent home brew establishment (Leipziger Brauerei an der Thomaskirche) which does a dark beer and a pilsner, plus suitable steaks etc. Though I didn’t recognise it without the tables outside I think this was the place whose neighbouring building caught fire (see previous visit on 11.7.99). Adequate breakfast at the Ibis, even if half a grade down from the InterCity. We just made the 0844 to Beucha where the Ferkeltaxi and trailer were waiting to go to Brandis. The junction is off a loop and just east of the station so honour was satisfied. The branch is very short (5 minute trundle) but used to (or maybe even does) continue further east. The conductor said it went to Trebsen but the language barrier prevented further discussion. 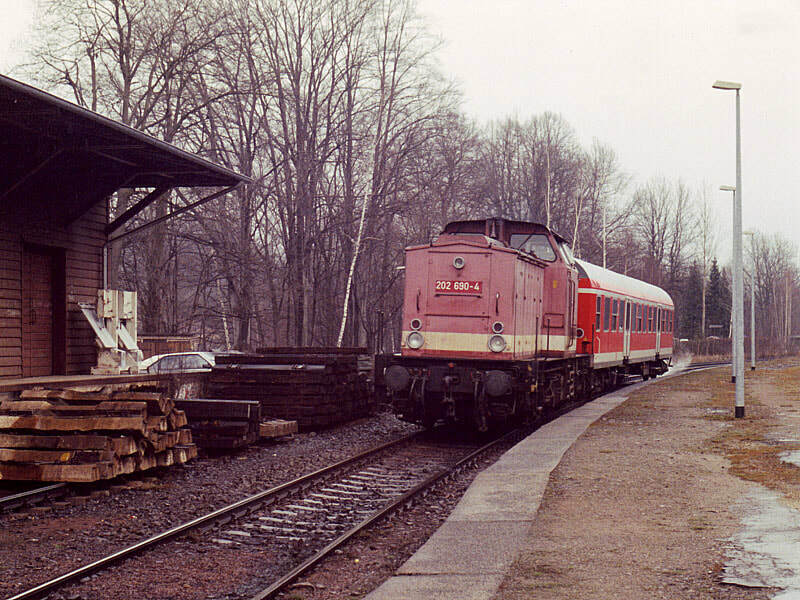 The RE to Dresden turned up on time at Beucha with a 232 and I was able to fill in the Leisnig - Döbeln gap. Döbeln Hbf proved to have a pleasant station buffet dispensing coffee and a drinkable pilsner at very modest prices. A dull ride was had to Chemnitz on the 1139 SE with, presumably, a 143 on the back. There is some very poor track on the branch (and bridges, seemingly). One stretch south of Annaberg-Buchholz and a long stretch between Cranzahl and Bärenstein where the rails look worn and many sleepers are rotted, split and/or broken. The speed limit here was 10 kph or even less. 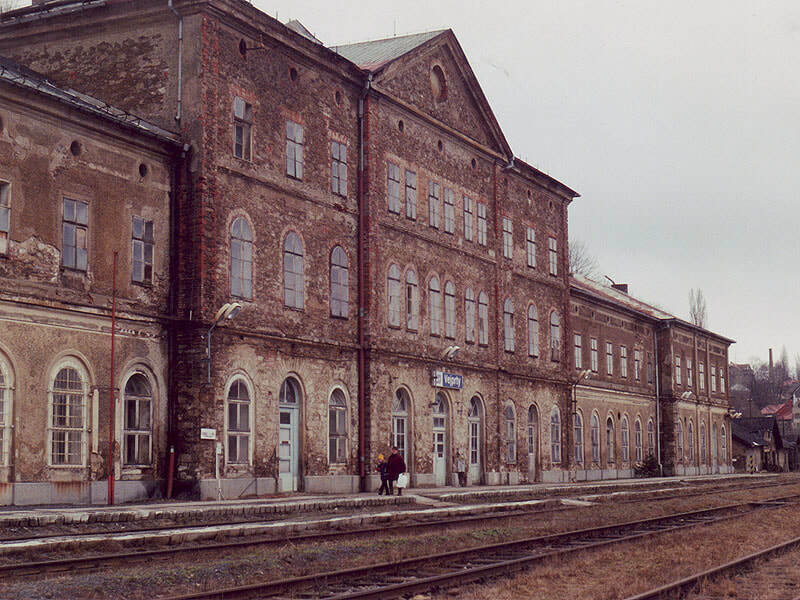 Arrival at Vejprty - a large and typically decrepit Czech station building - was 15 late and departure (at least) 15 early. Intending travellers must be warned! Fortunately I asked the conductor as we left the train or we would have been stranded. The last 2 km into Bärenstein from the junction with the closed line from (presumably) Königswalde has been relaid to a high standard. Confusion reigns. What is going on? 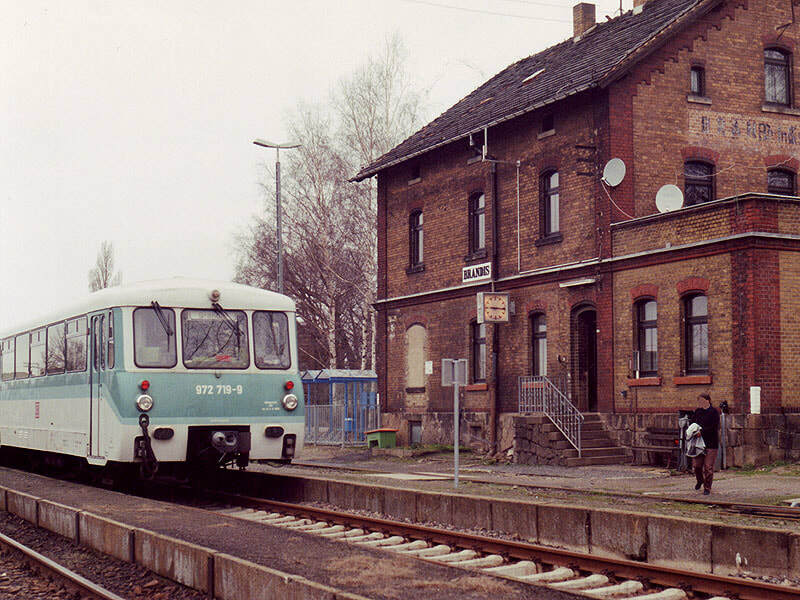 The Aue - Crottendorf line was showing signs of having had traffic in living memory but there was no sign of freight anywhere. A leisurely trundle down to Wilischthal got us there for about 1800 (12 minute booked stop at Anneberg-Buchholz Unterer Bf was a bit upsetting with the light fading). Earlier reasoning proved correct and the train continued to Zschopau with daylight still functioning. Another 15 minutes would have been getting a bit technical! Mission satisfactorily completed, we returned to Chemnitz and repaired to the Schnitzel Paradies for a very hot Pfefferschnitzel offset by a cooling Kapuziner. I returned to Chemnitz on a Zwickau train but decided not to bother with any more serious sulking. Having met up with H at the Hotel Europa we set off on 1031 to Aue - a 628 unit. Very suburban out of Chemnitz and quite dull for a while after that as it wound up a valley. The last section is excellent as the line eventually reaches about 1700ft then descends to 1000 by Aue. There is an impressive horseshoe down into Lössnitz Ober Bf; when I saw it from above I thought it was a different line. Aue itself looks exceptionally dreary, at least around the station, and we were happy enough to join another 628 back to Zwickau where there was a 6 minute connection for Leipzig (a 143). A refreshment stop was taken at Leipzig, causing us to fall out over mayonnaise! The 1524 IR to Cottbus was well filled but seats were found to Eilenburg (arr 1541). Here the buffet shuts at 1400 and the nearby pub from 1430 to 1730. Is this all some conspiracy? We retired hurt to the station to await the 1613 RB to Halle. The trip to Halle is very uneventful. Flat, straight and dull. The two curves at Delitzsch were noted, the north one being doable on the last RE of the day. A quick change at Halle and we were away on an IR to Stendal where the gamble [that the Hotel am Bahnhof would have a room] failed and we ended up in the very pleasant but expensive (including two taxi rides) Altstadt Hotel. Evening pork at the Ratskeller was highly satisfactory. Up betimes (too early - complaints from one’s companion!). The young lady in charge kindly procured a taxi for us and we made the 0737 IR to Berlin with ease. 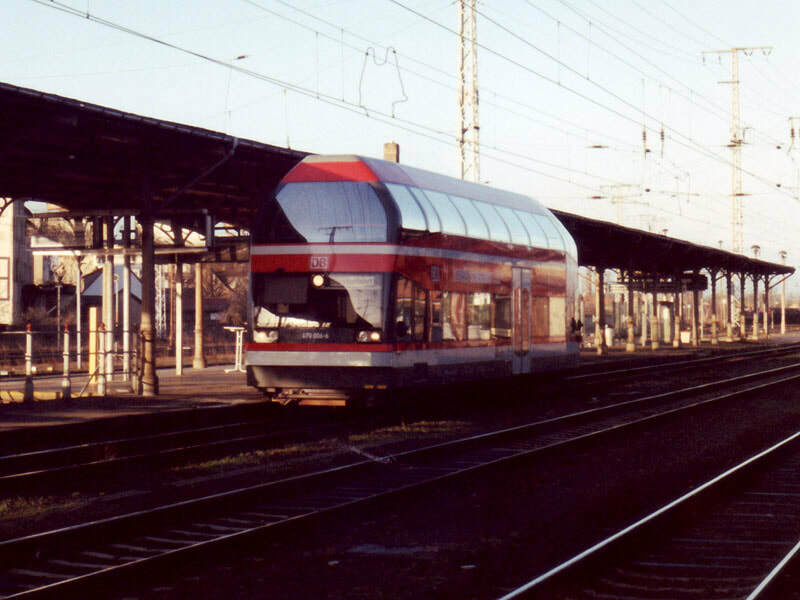 The previous evening I’d been unable to locate the planned Spandau - Oranienburg train in the timetable and had to substitute a tightly timed S-Bahn Charlottenburg - Lichtenberg. I fortunately had the sense to ask the travel centre at Stendal who confirmed IR2275 0906 Spandau - Oranienburg. And so it was. Spandau is quite impressive now with full length overall roof for the main line platforms and a shorter but still full length one for the S-Bahn platforms. 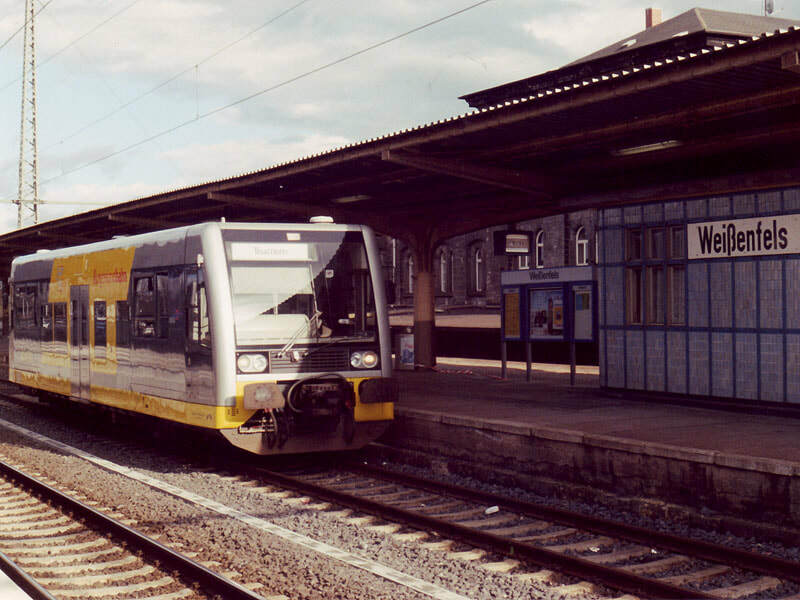 A 112 provided power for a short IR which went via the Aussenring. Oranienburg is under heavy rebuild but it’ll be nice when it’s done, honest. [Subsequent visits have disproved this assertion. It’s quite bleak on the main line side, in fact.] 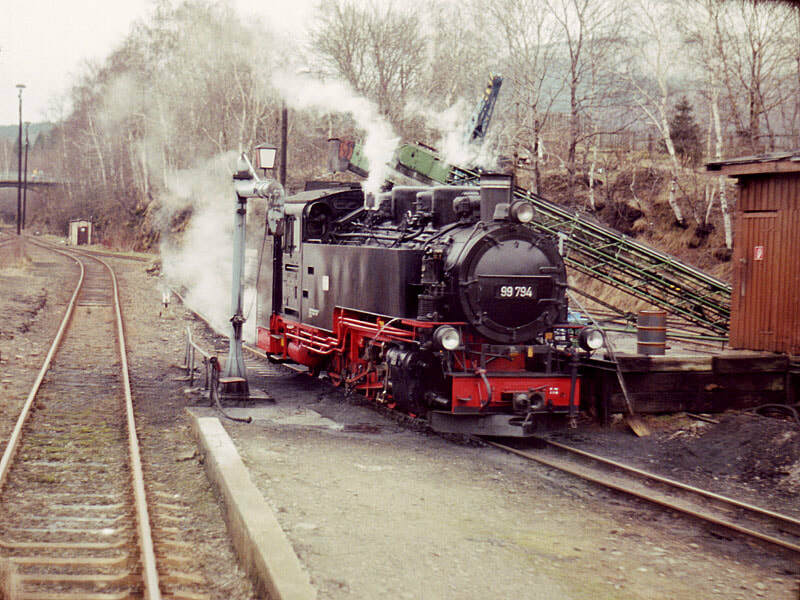 A 628 arrived on the Prenzlau train. What a boring line. Rain, fields, more rain, more fields. Lots of trees. Templin is very run down and depressing (large depot, yards once), Templin Stadt less so. [The town on the other hand is most interesting as I discovered on another visit some years later]. At Prenzlau a curve has been built from the original line towards Pasewalk, connecting with the former Prenzlau-Strasburg line so that Templin trains can do a horseshoe to the north of Prenzlau and come in from the Pasewalk direction. A north facing bay platform is used. A quick hop by IR to Pasewalk gave us a 6 minute connection on to the 1234 Ueckermünde (blue and cream Rabbit 218208). Ueckermünde is some distance (¾ mile?) from the town so after some deliberation we got a cab to ‘Markt’ where pubs/restaurants were rife. A kindly lady in ‘La Pampa’ steak house ordered a taxi for us and provided an excellent meal accompanied by Lübzer Pils and Erdinger. Total cost for the whole exercise including taxis and tip was about £19, which seemed highly satisfactory. 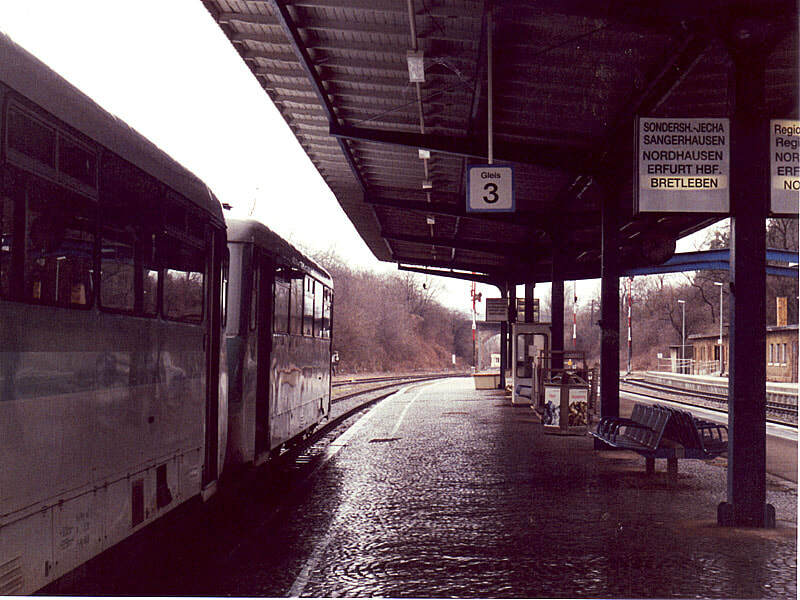 The Rabbit took us back to Pasewalk where it was replaced by a 232 for the train to go on to Sczeczyn. Why? We decamped and repaired to the travel center to enquire whether 1412 Berlin Zoo - Duisburg is an IC. Seemingly it is, which will be highly useful for tomorrow. 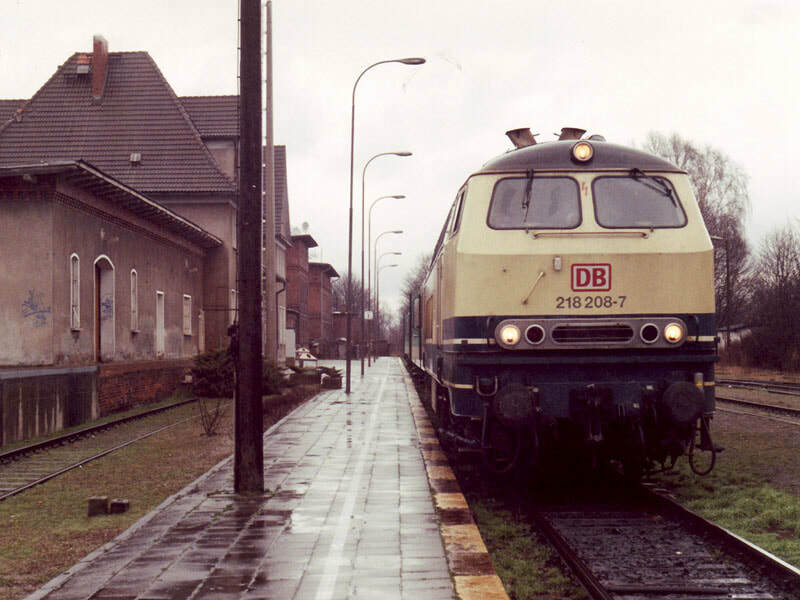 Another Rabbit provided power for the 1540 to Neubrandenburg which proved to be a bit of a trudge in the rain, though better than Löwenberg - Prenzlau. At Neubrandenburg we were a bit late, necessitating a very sharp exit on to the 1635 RB to Neustrelitz. At Neustrelitz we decamped again to await the arrival of the Rostock - Chemnitz IR so that we could travel back to Berlin in comfort. This was on time and reached Löwenberg well before the end of daylight thus satisfactorily completing the week’s track. A very hasty refreshment stop was made at Berlin Zoo accompanied by a debate as to the wisdom or otherwise of keeping to the arrangement we had made with the proprietor of the Hotel am Markt in Stendal. In the end we settled for 1916 IR to Münster (via Stendal). [We’re both old fashioned enough to believe that if you make an arrangement you should stick to it!]. On arrival back at Stendal the Hotel am Markt, a.k.a Pension am Markt, proved to be exemplary, beautifully modernized in ‘hotel chain’ style. Herself was pacified, and I (who had suspected it might be thus), was relieved. Franziskaner weissbier was taken at the pub round the corner in Markt. The hotel staff had pulled a few faces at the thought of 0645 breakfast but agreed when we explained about the 0737 to Berlin, and went so far as to order a taxi for us. A very nice breakfast too - slightly less scope than some but for 95DM all in, wholly admirable. A thoroughly revisitable establishment. The cab turned up early, thus giving us time to reserve seats on IC923 ‘Friedrich Harcourt’ for the afternoon before joining the 0737 IR to Berlin, almost empty again. We went through to Charlottenburg this time and spent the morning sightseeing. Sir Norman Foster’s dome on the Reichstag must be among the best free entertainment in the city. After a visit to the Kaiser Wilhelm church(es) and a restorative bratwurst followed by chocolate and orange cake we were ready for a siesta on IC923. The siesta was somewhat interrupted by three ‘emergency’ stops, two before Hannover and one just after. No apparent reason; presumably a fault on the loco. As a result we were about 8 minutes late by Bielefeld but suitable effort was applied and it was down to -1 by Duisburg. Odd shaped room in the Ibis – whatever next. An entirely splendid evening was had in Düsseldorf at Schumacher’s (the Altstadt one) and Uerige under the direction of an Englishman from a village near our home and a local called Klaus. Both establishments well worthwhile. S-Bahn to the airport, excellent ham scramble thereat, punctual 737 to BHX, Central Trains home pausing for lunch at the Great Western. What more can you say? I'm immensely grateful to the management of a certain West Midlands software house (I won't name them - client confidentiality and all that - but they'll know who they are!) for the opportunity to have a month off for the first time in 20 years. I had to go back to earning a living at this point - but it didn't last long and I was soon off again, this time to France for the CFBS gala, held every two or three years on one of the few French lines I felt any great wish to do!